Politicians and activists have said they will be holding a protest during the visit of US President Donald Trump to Ireland in November. It comes after the White House announced yesterday that Mr Trump will visit Ireland in November as part of a wider trip to Europe, to "renew the deep and historic ties between our two nations." Following the announcement, the Government said that Mr Trump’s visit will be an "opportunity to follow up on the issues discussed in the White House in March including migration, trade, climate change and human rights issues". However, the Labour Party, Green Party and Solidarity-People Before Profit have pledged to organise protests surrounding the visit. In a statement, Green Party leader Eamon Ryan said: "We're calling on Irish people to tell our Government to cancel this visit; and for them to demonstrate in never-before-seen numbers should they fail to do so." He urged the people of Ireland to "show their disgust and rejection of the Trump administration's policies by turning out, as we did during the Iraq War in 2003, in large-scale mass protest around the country." Labour Party leader Brendan Howlin has said that there should be no welcome for Mr Trump. Solidarity-People Before Profit TD Richard Boyd Barrett described Taoiseach Leo Varadkar’s decision to welcome President Trump to Ireland as "shameful." He said he has already contacted other groups, organisations and parties with a view to organising major demonstrations when Mr Trump arrives. Workers' Party Cork City Councillor Ted Tynan said Mr Varadkar, and Minister for Foreign Affairs, Simon Coveney, were not representing the views of the majority of Irish people in extending the welcome. "The deep and abiding connection between this country and the United States is based, not on the fawning and false obsequiousness of the Taoiseach and Minister Coveney, but on the shared experiences of our peoples and their common struggles." Tánaiste and Minister for Foreign Affairs Simon Coveney said that Mr Trump's visit to Ireland will probably take place on his way home from ceremonies in Paris on 11 November to mark the centenary of the armistice which ended World War I.
Mr Coveney said the details of the visit have yet to be finalised but it would be a short trip and undoubtedly Mr Trump would visit his own property in Doonbeg, Co Clare, and the expectation is he will meet the Taoiseach in Dublin. Mr Coveney said that Mr Trump is a controversial president, but he has been hosted in other European countries, and when he asks to come to Ireland the Government will facilitate the visit. He said people should not confuse the facilitation of a visit of President Trump with an endorsement of his administration's policies in many areas. Mr Coveney added that it is no secret that Ireland would have a real difficulty with the approach that Mr Trump has taken in many areas including climate change, migration, trade policies and the recent approach towards the Middle East and Iran. He said this would be an opportunity for a mature discussion with a US president, here in Ireland, to talk about the differences of opinion and different perspectives on many issues and to raise Irish concerns. 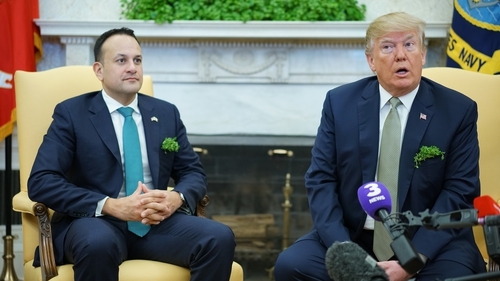 Fianna Fáil’s foreign affairs spokesperson has said that the party will welcome Mr Trump’s visit, and said it was an opportunity to emphasise the continuing need for international diplomacy. This visit of President Trump is an opportunity for the Government to state Ireland’s position that the need for decency, compassion, respect for international diplomacy and integrity has never been as important and as necessary as it is today." In a post on Twitter, Niall Collins said: "The strong bonds that tie both Ireland and the United States are crucial to our country's future prosperity. In the past, we have welcomed previous US Presidents, and we will also welcome the visit of President Trump. "This visit of President Trump is an opportunity for the Government to state Ireland's position that the need for decency, compassion, respect for international diplomacy and integrity has never been as important and as necessary as it is today." Mr Trump was originally invited to Ireland by former taoiseach Enda Kenny on his final St Patrick's Day visit to the White House in 2017. Details of the visit have yet to be released, however it is thought he will spend two days in Ireland. The visit will be the first time that Mr Trump has visited Ireland since he entered the White House. It follows a meeting between him and Mr Varadkar at the White House last March.